Yesterday, we gave you a first look at the adult Harry Potter (Jamie Parker), his wife Ginny Potter (Poppy Miller) and their son Albus Severus Potter (Sam Clement) in the highly-anticipated stage play Harry Potter and the Cursed Child. The play debuts with previews in London starting June 7, with the first official performance set for July 30. 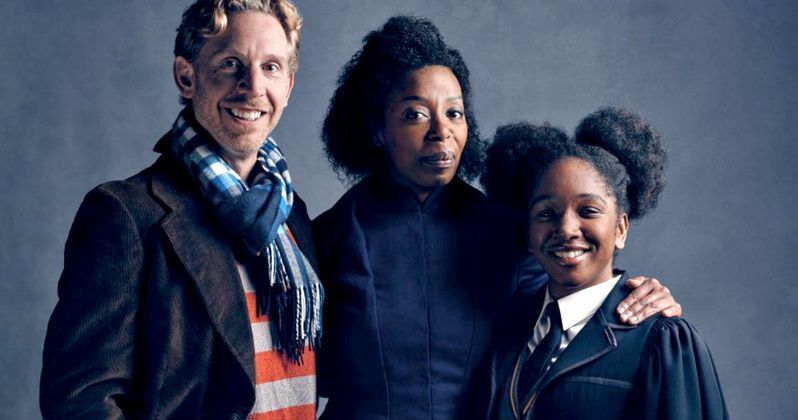 As we get closer and closer to this play's debut, today we have even more photos which reveal the Weasley family, Ron (Paul Thornley), Hermione (Noma Dumezweni) and their daughter Rose Granger-Weasley (Cherrelle Skeete). The photos, which offer our first look at the actors in their official costumes, debuted on Pottermore, where these cast members also shed new light on the story and their characters. Paul Thornley revealed that the play opens as the Weasley daughter is about to follow in her parents' footsteps by attending Hogwarts School of Witchcraft and Wizardry. Here's what the actor had to say below. "It's 19 years later when the play begins. Ron is married to Hermione Granger and they're now the Granger-Weasleys. Our magnificent daughter Rose Granger-Weasley is about to start at Hogwarts, which is obviously a big day for everyone." It was always difficult being Harry Potter and it isn't much easier now that he is an overworked employee of the Ministry of Magic, a husband and father of three school-age children. While Harry grapples with a past that refuses to stay where it belongs, his youngest son Albus must struggle with the weight of a family legacy he never wanted. As past and present fuse ominously, both father and son learn the uncomfortable truth: sometimes, darkness comes from unexpected places. As for the Weasley's, author J.K. Rowling teased that their daughter Rose takes after her mother, while praising the work of all three actors. Here's what the author had to say below. "Rose is like her mother, but more secure, more grounded. She was born to wizards and knows her place in the world. Cherrelle plays her perfectly: bossy but deeply loveable." Cherrelle Skeete has appeared on stage in prestigious productions such as The Lion King and Wind in the Willows. She has also appeared TV shows such as Call the Midwife and Danny and the Human Zoo, where she starred alongside Evanna Lynch, James Phelps and Oliver Phelps from the Harry Potter movies. Here's what the actress had to say about taking on the role of Rose Granger-Weasley. "I can't think about how big it is or I'll just faint. Putting on my uniform, ready to go to Hogwarts, and seeing everyone else in their uniform was exciting. I've been looking at it every day in the wardrobe department, waiting for the day I can get on the Hogwarts Express. Rose is ambitious, obviously her mum is Hermione so she's got a lot to live up to. I think they're quite similar in the fact they put a lot of pressure on themselves. And she just wants to do the right thing." The rest of the cast is rounded out by Nicola Alexis, Helen Aluko, Jeremy Ang Jones, Rosemary Annabella, Annabel Baldwin, Jack Bennett, Paul Bentall, Anthony Boyle, Zoe Brough, Morag Cross, Cristina Fray, Rudi Goodman, Claudia Grant, James Howard, Christiana Hutchings, Lowri James, Chris Jarman, Martin Johnston, Bili Keogh, Chipo Kureya, James Le Lacheur, Helena Lymbery, Tom Mackley, Barry McCarthy, Sandy McDade, Andrew McDonald, Adam McNamara, Tom Milligan, Jack North, Alex Price, Stuart Ramsay, Nuno Silva, Esther Smith, Nathaniel Smith, Dylan Standen and Joshua Wyatt. Among these names are seven child actors who will alternate between roles. Pottermore also teased that they will be revealing two more characters from this wizarding world tomorrow, so be sure to check back for that. Until then, take a look at these new photos from Harry Potter and the Cursed Child.